No. 934 is an 850°F (454°C), cabinet oven from Grieve, currently used for heat treating at the customer’s facility. Workspace dimensions of this oven measure 38” W x 20” D x 26” H. 10 KW are installed in Incoloy sheathed tubular heating elements, while a 600 CFM, 1/2-HP recirculating blower provides horizontal airflow to the workload. This Grieve cabinet oven has 6” insulated walls, an aluminized steel exterior and Type 430 stainless steel interior. Controls on the No. 934 include a digital indicating temperature controller, 10” diameter circular chart recorder and SCR power controller. 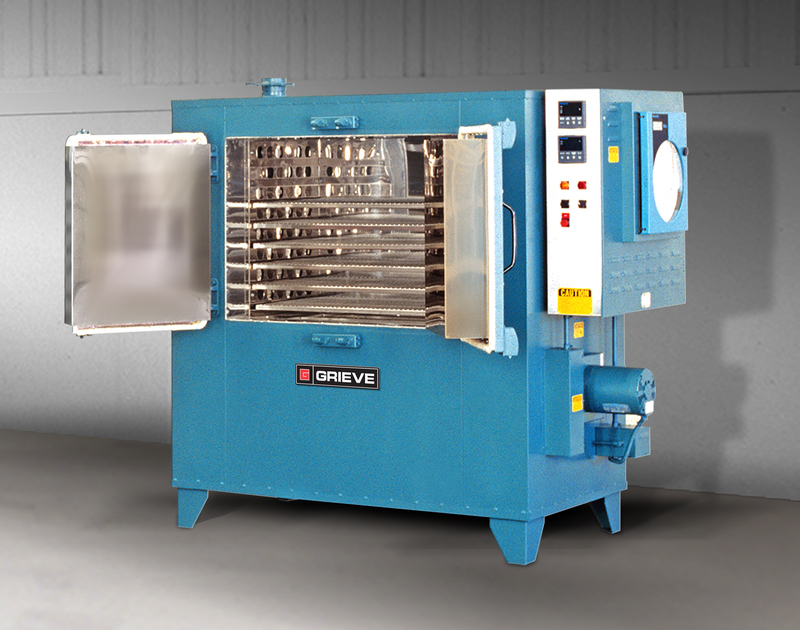 Industrial Ovens from Grieve are available in wide range of designs for your application. Our Ovens and Furnaces come in variety of styles including Bench Ovens, Box Furnaces and Conveyor Belt Ovens. In addition, our Ovens can be used for powder coating, curing, baking, drying, and other applications requiring circulation of heated air. Custom Ovens include Tunnel Ovens and Continuous Ovens built to your specifications. Since we are the manufacturer, in business since 1949, all our Industrial Ovens and Industrial Furnaces are given a 100 point in house performance inspection prior to shipping. For more information, visit www.grievecorp.com or contact sales@grievecorp.com.